Brach’s product line continues to mystify me. Here in this collection called Orchard Fruit Jelly Beans, we have another solid “jelly bean” product – far more pleasant than the “jelly bird egg” line (see prior reviews of the Classic and Speckled Jelly Bird Eggs) – and yet, it’s not just the same beans as the pleasant Island Fruit Jelly Beans with different flavors. The physical characteristics are definitely different. I even pulled out my archived baggie of uneaten beans from the Island Fruit review to confirm! I tried to temper my expectations of these after the pleasant surprise of the Island Fruit beans, but I again find myself all too happy to put away a good number of these beans throughout the past week. 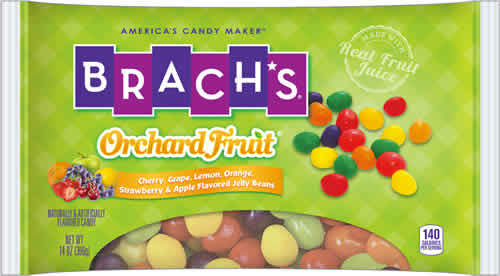 Brach’s does a good job on this category with their jelly beans, compared to their tubby jelly bird eggs. It is here that we immediately notice some difference between the Orchard Fruit and Island Fruit varieties, though. Average size is slightly larger than the Island Fruit beans, and the shape is more rounded, and less oblong. Essentially, they’ve gotten more girth around the middle and are now more of an egg shape than a bean shape. There is no dimple, but neither are there any flat sizes or sharp edges. Outliers are few in number. Chewability is also good, but not perfect. The shell is good and solid without being hard, but once you’ve broken through, the insides require a little more effort to chew than I’d like. The Orchard Fruit beans fall slightly behind Island Fruit on this score. Texture is probably the clearest indicator of the fact that these two jelly bean varieties were not produced by the same process. With the Island Fruit beans, I noted that the shell broke down into fine particles, and docked it a point for that. These Orchard Fruit beans, on the other hand, crack into large hunks of shell, which feel just perfect in the mouth. The insides again are smooth. These beans edge out the Island Fruit Beans in this category. This is a classic lineup of flavors, and each performs pretty well. This cherry flavor doesn’t stand out as amazing, but I’m hard pressed to find any cherry flavor unpalatable. Grape seems particularly good at reminding me of a concord grape. Lemon could use more acidity, as usual, but it’s not bad. I often feel like artificial orange flavors are trying too hard, but this one seems to avoid that trap. Not much to say about strawberry, which seems like an average strawberry flavor. Finally, Apple may be the weakest link. Its flavor is far too subtle. Some individual beans can have a little extra acid kick to them, which is always a pleasant surprise. I wish that was more consistent. Overall, though, I was very satisfied with these flavors. Like last week, here we have another hefty half-dozen that is somewhat physically hard to handle. And while the thicker shells contribute to a strong presence of white sugar flavor, the intrinsic fruit flavors hold up quite well. Brach’s is beginning to turn things around here on A Boy and His Beans . I am very curious to see what the future holds for their bewildering brand! A collection of jelly bean reviews. © 2019 Scott Cranfill. Licensed under a Creative Commons Attribution-ShareAlike 4.0 International License.